We had a fabulous evening last night at the lovely Marlborough Theatre sharing this term’s work by our very talented performance students. Next term’s performance course (Creating a Short Puppetry Show) is already more than half full with returning students, so if you’re interested, get signed up! 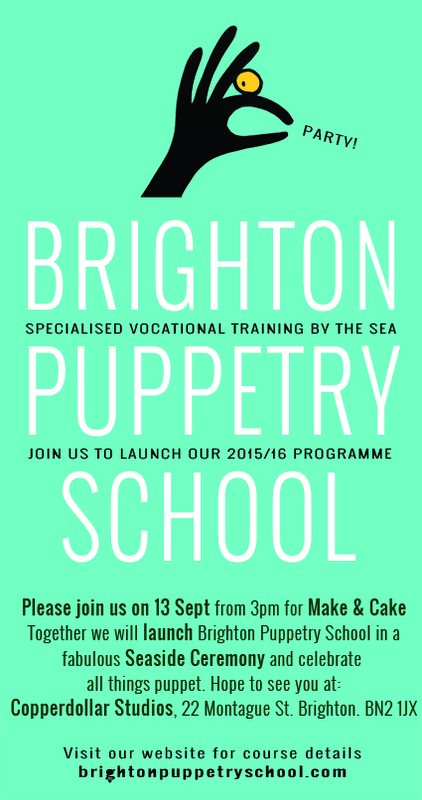 Join Brighton Puppetry School for a weekend of specialist puppet making. These large-scale puppets have moving mouths making them perfect for delivering Christmas day speeches and for Festive Carol Singing! Of course a puppet is not just for Christmas and this style of puppet is great for exploring the use of text in puppetry all year round! We’re even planning a weekend course: Voicing Puppets, in 2016 to help to bring your creation to life. Who will you make? – whether muppetish or more life-like – the puppet’s character is up to you. You will discover how to make an effective moving mouth and will construct the puppet’s head and torso using soft modelling techniques, you will add one life-sized arm to the puppet and an empty sleeve – with one hand operating the puppet’s head and the other becoming the puppet’s second arm your Talking Puppet will be capable of very precise hand movements to accompany it’s speech. High Five! You will leave the course with puppet making techniques to transfer to your future puppet projects. Click here for more info, bookings and enquiries.